Liquid, solvated amine based carbon capture is the core of all commercial or planned CO2 capture operations. Despite the intense research, few have looked systematically into the nature of amine molecules and their CO2 interaction. Here, we report a systematic introduction of linear ethylene amines on the walls of highly porous Davankov type network structures through simple bromination intermediates. Surprisingly, isosteric heats of CO2 adsorption show a clear linear trend with the increase in the length of the tethered amine pendant groups, leading to a concerted cooperative binding with additional H-bonding contributions from the unassociated secondary amines. CO2 uptake capacities multiply with the nitrogen content, up to an unprecedented four to eight times of the starting porous network under flue gas conditions. 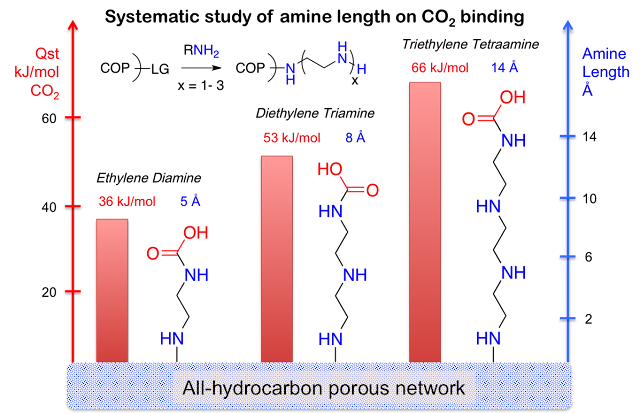 The reported procedure can be generalized to all porous media with the robust hydrocarbon framework in order to convert them into effective CO2 capture adsorbents.